Embroidery artist Yumiko Higuchi offers modern makers a fresh new spin on her beloved designs by combining embroidery stitches with hand appliqué. Learn how to use felt, cotton, and linen to create beautifully layered designs full of texture and contrast, then embellish with just a handful of basic embroidery stitches. With over 30 motifs inspired by nature, you’ll find designs for hydrangeas, sunflowers, lilacs, tulips, poppies, birds, bees, strawberries, and more. Use these motifs to create any of the sophisticated bags, pincushions, coasters, tea towels, and wall art projects included in the book, or be inspired to design your own. Step-by-step color photos illustrate Higuchi’s favorite tips and techniques for transferring designs, appliquéing motifs, and embellishing with embroidery stitches. Full-size templates and easy-to-follow instructions are included for each design, so you can get started stitching straight away. 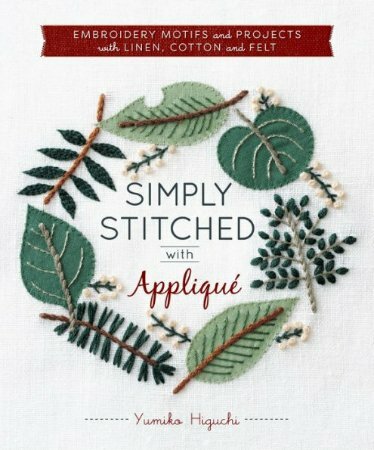 Full of beautiful photos and simple, yet striking designs, Simply Stitched with Appliqué is an endless source of inspiration, making it a must-have for every stitcher, quilter, and modern maker.